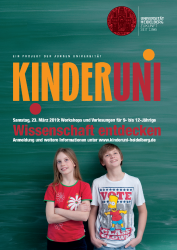 A GIScience Heidelberg team (Melanie Eckle, Katharina Przybill, Vivien Zahs, Martin Hilljegerdes and Sven Lautenbach) takes part in the Kinderuni 2019 coming Saturday. Our aim is to introduce giscience methods in a playful and hands-on way to the participating kids. We will introduce remote mapping, 3d pointclouds and much more in a scavenger hunt - building on a program developed by Carolin Klonner et al. over the last years. GIScience has been contributing to Kinderuni since 2014. Details on our workshop can be found here.